Welcome to a new year and a new website for PRSA Capital Region NY. Special thanks to Mike Lesczinski, Bryon McKim, Judi Henrikson and Siobhan Kent for making all the magic happen! My Mom and Dad used to accuse me of being a Whirling Dervish when I was a kid (with a very messy room). I didn’t know what that meant, but based on the level of disorder, I pictured a Whirling Dervish to be the cousin of the Tasmanian Devil from Saturday morning cartoons. As is typical of most children, I knew in my heart of heart that my parents were WRONG about me being a Whirling Dervish and as time passed, my housekeeping skills greatly improved as has my appreciation of my parents’ interesting analogies and word choices (anyone else still refer to an icebox?). 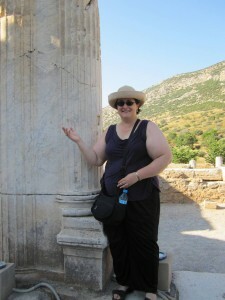 In 2010, I enjoyed an adventure to Turkey. From cosmopolitan Istanbul to the lunar-esque landscapes of Cappadocia, it was a phenomenal trip with rich history, gorgeous sights and museums, fantastic food and a wonderful group of fellow travelers. The trip offered a number of new experiences for me: it was my first overnight on a train, my first hot air balloon ride, my first time on the continent of Asia. There were also a number of personal high points…with the help of our wonderful guide Aysegul, we snuck in a trip (off itinerary) to the village of Urgup where my grandmother (mother’s mother) was born and raised. We also visited the city of Konya and the mausoleum/museum of Rumi, the 13th century poet and theologian, whose followers are known as Whirling Dervishes! As I learned on my visit, Whirling Dervishes were not about chaos. They practiced a form of religious observance that was a dazzling and dizzying display of balance, discipline, fortitude and non-motion sickness to reach an inner peace. Today, the dervishes perform as a cultural or tourist attraction, but I liked the original message of achieving stability out of (misperceived) frenzy. ….which brings us to PRSA Capital Region NY. an expanded slate of programs (including our 4th Annual Empire Awards). Maybe my parents weren’t so wrong after all…cheers to more adventures!